Researchers at the Joint Center for Structural Genomics have obtained the first look at nsp1 (nonstructural protein 1), a major factor in the pathogenicity of the coronavirus that causes SARS (severe acute respiratory syndrome). Ever since the international outbreak of the virus in 2003, researchers have been studying this virus, hoping to find methods to fight it if it reemerges in the future. Nsp1 may play an important part in this fight. The genome of the SARS coronavirus encodes 28 proteins that orchestrate its lifecycle of cell death. Four of these are structural proteins on the surface of the virus, sixteen are nonstructural proteins involved in replication (named nsp1-nsp16), and the rest are a loose collection of "accessory" proteins. Some of the nonstructural proteins have familiar functions common to many viruses, such as a polymerase that replicates the RNA genome and proteases that cleave the viral polyproteins into functional pieces. Others, including nsp1, play supporting roles by suppressing the normal processes of the cell and blocking the normal defenses. Nsp1 is an attractive target for therapy since it plays a role early in infection: it is one of the first proteins produced by the virus and it has been shown to be important for the pathogenicity of the virus. By studying viruses that are missing nsp1, researchers now think that nsp1 blocks the normal innate immune response that protects us from viral infection. This allows the SARS coronavirus to infect cells and replicate, free from our normal defenses. Recently, however, researchers have used this knowledge to fight back. They have designed a vaccine by engineering a coronavirus that is missing nsp1. This mutant coronavirus is weakened, much like the attenuated polioviruses used in the polio vaccine, allowing them to stimulate the immune response without leading to a full infection of SARS. SARS coronavirus nsp1 has an unusual new fold, composed of an irregular beta barrel of six strands (in yellow) bridged by an alpha helix (in magenta). 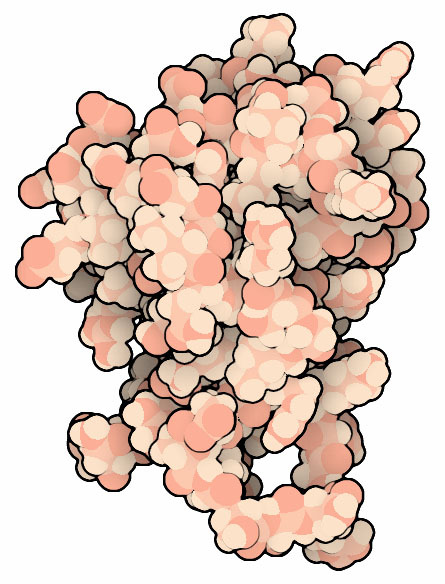 The structure of nsp1 (pdb entry 2hsx) yielded another dividend: a new fold. 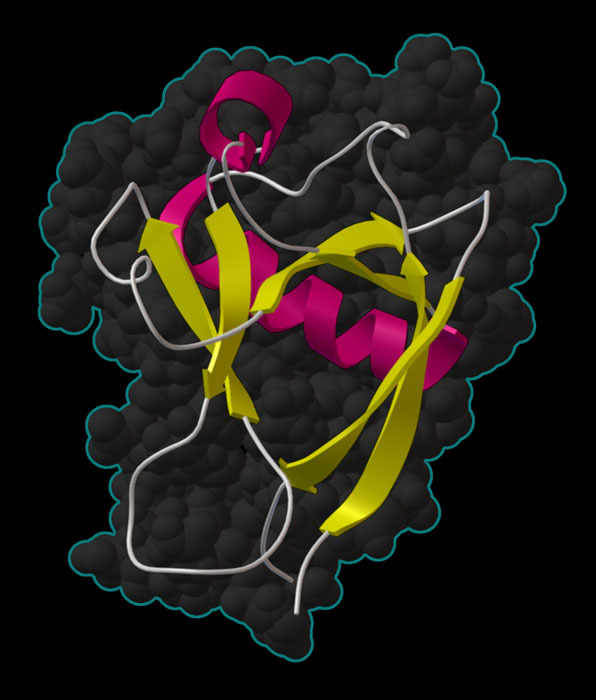 Nsp1 is a small protein with 179 amino acids. Both ends of the chain are disordered, but the center (residues 13 to 128) form a stable folded structure. The NMR structure obtained by JCSG reveals an entirely new fold composed of an irregular six-stranded beta barrel with a bridging alpha helix. The SARS coronavirus has actually been the source of a surprising number of new protein folds: of the 16 structures that are currently available, 8 show a new fold. This may be a reflection of the rapid evolution of viruses, which allows more room for natural experimentation with new protein folds. This picture was created with the Python Molecule Viewer. For a high resolution tif image, click here. M. S. Almeida, M .A. Johnson, T. Herrmann, M. Geralt and K. Wuthrich (2007) Novel beta-barrel fold in the nuclear magnetic resonance structure of the replicase nonstructural protein 1 from severe acute respiratory syndrome coronavirus. Journal of Virology 81, 3151-3161. M. Bartlam, Y. Xu and Z. Rao (2007) Structural proteomics of the SARS coronavirus: a model response to emerging infectious disease. Journal of Structural and Functional Genomics 8, 85-97.